The Televue 11mm Plossl Eyepiece features noticeably less astigmatism and lateral color at field's edge. 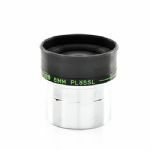 The Televue 11mm Plossl Eyepiece has an Apparent Field of View of 50º and Eye Relief of 8mm. For a bit more than generic brands, you can own a genuine Tele Vue Plossl!